The structure anchoring Downtown Lafayette’s new Riverfront Promenade with 99 apartments, MARQ includes 4,000 square feet of first-floor retail, with an Old National Bank branch. It’s within steps of Riehle Plaza’s Amtrak Station, the pedestrian bridge to West Lafayette, the Courthouse, the CityBus Center, and Downtown employers. 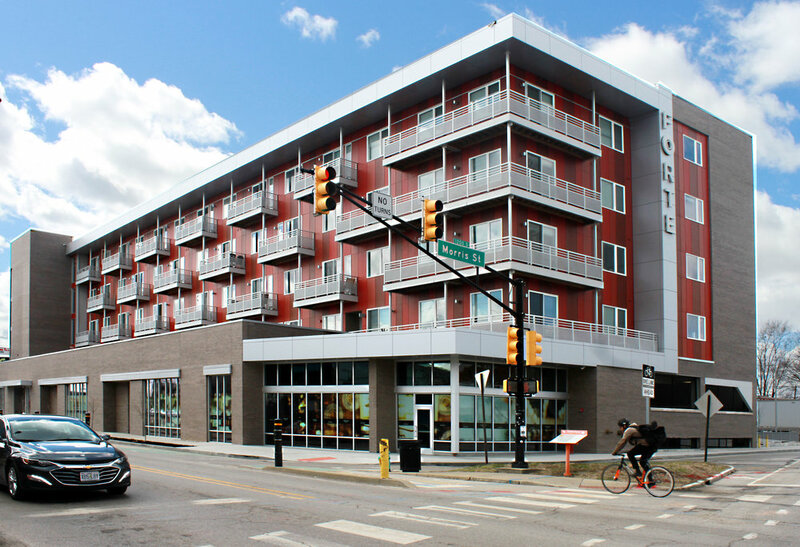 The first major construction project in Fountain Square in more than half a century includes 64 apartments and 4,000 square feet of first-floor retail space that opens onto the Shelby Street bike trail. Not only is it steps from Fountain Square’s thriving restaurants and nightspots, Forte includes 55 public parking spaces for public parking convenience. The newest addition to the Holy Rosary/Fletcher Place neighborhood boasts 68 apartments with 9 unique floor plans on four floors. There’s 9,000 square feet of ground-floor commercial aside the Cultural Trail, including the wildly popular Tappers Arcade Bar , creative Asian eatery Rook and Old National Banks walk up banking center. Plenty of surface parking, too. With 56 distinctive apartment residences right on the Cultural Trail, this landmark project is the “hinge point” between Downtown Indianapolis and the Fountain Square Cultural District. Its NUMBER square feet of commercial space fronting the Cultural Trail includes award-winning Chilly Water Brewing Co. and popular Indian eatery Spice Box. This distinctive 11-apartment infill project that was designed to complement the historic neighborhood includes 2,000 square feet of retail frontage on well-traveled College Avenue, just a short walk from major employers. Winner of the 2008 Indiana Landmarks Historic Preservation Adaptive Reuse Award, this unique building offers 3,700 square feet of office space as well as 8 loft apartments right in the heart of the burgeoning Fletcher Place neighborhood. Projects that respect, celebrate, and transform urban communities. The Deylen team loves the character of urban landscapes and authentic communities. With every project we develop and manage, our goal is to reflect and enhance everything that’s wonderful about neighborhood living, providing benefits to both residents and the community. Our approach to commercial space is designed to support a vibrant streetscape and draw businesses that serve residents’ needs while complementing the neighborhood’s character. And our residential projects create unique spaces the offer amenities and a level of service residents won’t find anywhere else. Here are highlights of our recent projects.